Thus guru Kelucharan Mohapatra (1926-2004), the renowned master accredited with the revival of Odissi classical dance in recent history. 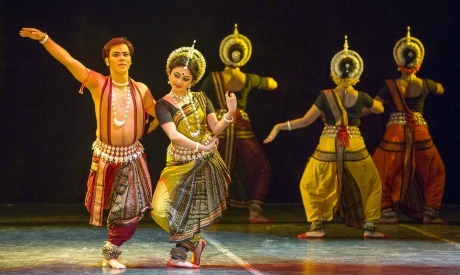 From India by the Nile (23 April-7 May) to the Tagore Festival(8-12 May), the subcontinent has been in the spotlight in Cairo for several weeks now. There have been dozens of artists offering their best, but one event attracted my attention in particular: Dona Ganguly and her troupe. 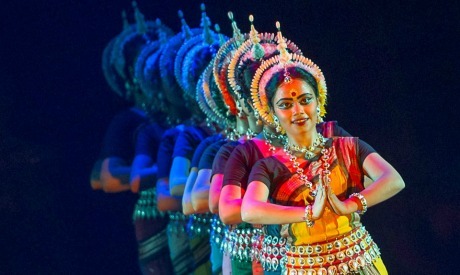 Staging her first performance of India’s classical dance Odissi on 30 April at the Al-Gomhoreya Theatre, Ganguly carried this visually mesmerising art form to Port Said (2 May), Ismailia (4 May), Alexandria (6 May) and Beni Sweif (7 May). And, though on 9 May she returned to Cairo with a different show – Shapmochan, a dance drama written by Tagore and performed within the festival dedicated to the poet – it is her Odissi that I want to focus on. 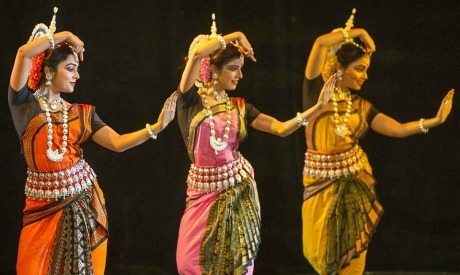 Odissi, one of eight recognised classical dances in India, is not too familiar to the Egyptian audience. In 2013, Surupa Sen with other members of the Nrityagram, a residential classical dance school in Bangalore, Karnataka performed Odissi in Cairo and Alexandria – but Odissi hadn’t been seen since. Three years later, Dona Ganguly and students of Diksha Manjari, the dance school she founded in Kolkata, bring back this cultural treasure. Ganguly’s performance in Egypt included 11 dancers: ten women and one man, joined in the beauty and grace of one of India’s many faces. As if painting the sacred images and celebrating the spirituality, filled with colours and precision of movement, the troupe walked the viewer through four consecutive parts of the dance Mangala Charana, the customary invocation; Ardhanarishvara, which presents the androgynous character of the Hindu deity Shiva; the sensual Pallavi; and the closing segment celebrating Durga, the mother of the universe in Hinduism, and the deity depicted with ten hands. As the dancers move through the consecutive segments they create an aesthetic harmony in each, whether executed on the individual level, in pairs or in a group, and whether presented in unison or creating complex tableaux. Even if the array of symbolism hidden in Indian mudras (hand gestures) and abhinayas (face expressions), which include expressive eye movements, cannot be deciphered by a viewer not acquainted with this vocabulary, one can still enjoy the breathtaking collection of picturesque compositions. Odissi is believed to be the oldest surviving dance form in India, mostly due to its historical connection with the sculptures and bas reliefs found in the Orissan temples in the state of Odisha. Archeological evidence from the second century BCE suggests that the dance was performed in those temples by a group of women, Maharis, as part of worship. Later evidence indicates that by the sixth century CE, young boys, known as Godipudas, danced the Odissi dressed up as women. Odissi also found its way to the courts and palaces of the high and mighty, pleasing the eyes and senses of lords, princes and kings (the Nartaki tradition). 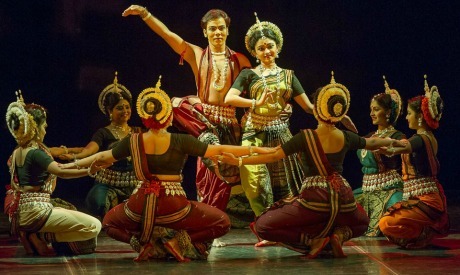 But it wasn’t until India’s independence that Odissi, alongside other classical dance forms, was revived and codified with the aim of preserving the country’s cultural heritage. And while to millions of Indian art practitioners, this dance is one of the ways of keeping the tradition alive, to the contemporary audiences from other cultures, Odissi is an opportunity to embark on a unique journey: a rich spectrum of colours, forms, expressions and movement. “The dance originated in the temples and it reflects the sculptures which take many different poses. The essence of Odissi therefore is based on a depiction of those poses,” Ganguly tells me when we meet the day after her Cairo performance. She goes on to explain that the movement serves as a creative fusion between the poses and allows the performer to carry the story forward. In other words, the dancers demonstrate the stories interweaving the poses into them. “The combinations can vary and they can incorporate men and women. Our group has a majority of ladies, maybe it is sort of our characteristic,” Ganguly smiles. Ganguly is one of the India’s most acclaimed Odissi dancers. She is a student of the late Kelucharan Mohapatra, the guru of classical dance whose famous quote opens this article. She started learning Odissi at the tender age of three. Ganguly’s performances soon gained recognition in India and internationally. In 2000, she opened her Diksha Manjari, a school that apart from teaching Odissi offers classes in yoga, drawing, karate and swimming. “Lata Mangeshkar, India’s famous playback singer, inaugurated the school,” Ganguly recalls the magnitude of the event, pointing to the school as an important step in her career. She then proudly mentions the recent celebrations of the school’s 15 years of practice, an event which was attended by India’s mega-star Amitabh Bachchan. Egyptian audiences who followed the Kathak classical dance – performed on many occasions in Cairo and Alexandria – will definitely spot similarities between the two forms. Ganguly points to the particularly evocative presence of Tribhangi (a “tri-bent” pose) in Odissi, copied from the sculptures and bas-reliefs. She explains the three bends – at the neck, waist and knee – which give a slight S shape to the body. The same pattern is replicated on a smaller scale, such as arms bending with hands, legs with feet. The dances also differ in costumes. “In Odissi itself, we change costumes depending on the performance or even the day.” Ganguly revealed that the troupe brought different sets of costumes for each performance in Egypt’s five cities. But in all these dances, music plays an integral role in the performance. Odissi is usually performed with a group of musicians, who play a variety of instruments: harmonium, bamboo flute, violin, veena (plucked string instrument) or percussions such as khartal or mridang as well as a vocalist who sings ornamented lyrics from ancient texts to different talas (rhythmic patterns). But in Egypt, Ganduly performed to recorded music.